Whether you’re touring the entire state with the family or even on your honeymoon, it’s always nice to have an excuse to take some time from the busy day-to-day of an Alaska adventure vacation and slow it down with a fun date with your number one. Since the perfect date is different for each of us, we’ve lined out three different options that offer something for everyone. If you’re here long enough, you might even have time to check them all off your list! 4 p.m. – Sip a glass of champagne on the terraced deck with a view of the Chena River. 5 p.m. – Enjoy a delicious meal for two at The Edgewater Dining Room. Try some hand-breaded coconut Alaska crab cakes, beer-battered fish and chips with Alaska cod or keep it simple with a fresh filet of wild Alaska salmon. For the less seafood inclined, the dining room also serves up decadent reindeer sausage nachos and, of course, classic burgers. 6:30 p.m. – After you’ve stuffed yourselves silly, head over to the ever-popular HooDoo Brewing Company for a cold glass of local beer. Try selections on tap like the Equinox Pale, the Vanilla Porter and the chocolaty HooDoo Stout. You can even take home a growler of your favorite brew! 7 a.m. – Fuel up! Grab breakfast at the Eagles Crest Dining Room and enjoy a smoked salmon scramble or a stack of hot pancakes. Directly following breakfast, layer up and embark on a day of class II rafting on the Kenai River. You’ll get up-close and personal with the Kenai National Wildlife Refuge and in addition to wildlife and birds you’ll see gorgeous scenery and stunning mountains. You’ll be outfitted in full gear and served a tasty lunch as well. This tour can be booked through our lodge’s tour desk leading up to your stay. 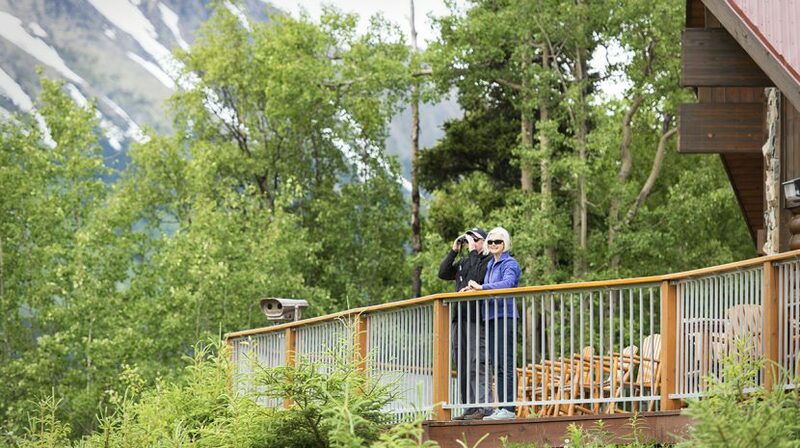 When you’re on vacation in Alaska, mountain views can step in for Netflix any day of the week, especially when you’re near Denali. Sometimes the best date of all is to sit back, relax, and enjoy the moment with your special someone. Spend the day trading the screen for a bus window and take a guided bus tour into Denali National Park and Preserve. Your chances to see wildlife and North America’s tallest peak will be high as you learn about the history and culture of the park. Even better? You’ll get to snuggle up close next to your honey for the long ride.